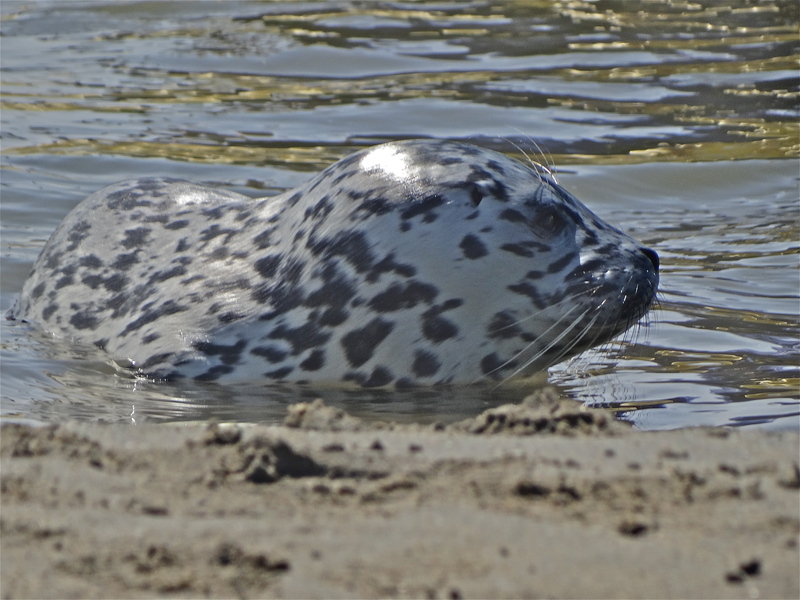 Harbor Seal pupping season is in full swing at Elkhorn Slough and at other locations along the Central California Coast. When observing harbor seals, please keep your distance and use a telephoto lens. Make every effort to avoid separating moms from pups and never disturb a pup that is alone onshore. The mother harbor seal may be close by and will hopefully reunite with the pup once humans depart the area. This young pup was actively making a distress cry to locate its mother sounding something like Maaaaaa. Vocalization and scent are two key mechanisms that a mother harbor seal uses to locate her pup. Born at around 15 to 25 pounds, harbor seal pups will enjoy a rich diet of milk that is 40% fat and will weigh approximately 50 pounds as its prepared to be weaned. After 6 weeks the pups are weaned and will now forage and avoide predators on their own. While in-utero, harbor seal pups, have a white soft coat that is typically shed before birth. In Arctic regions, the lanugo (white coat) is shed after birth. The spotted coloration provides camouflage while resting along our rocky shores.